Cutting phrgamites does very little to dissuade the regrowth of this invasive plant. 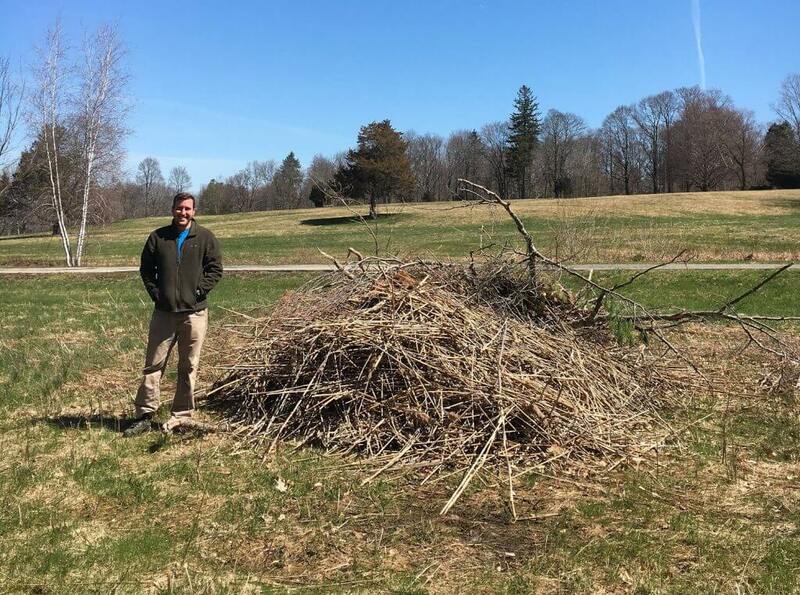 Back in February, we took advantage of a few unseasonably warm days to go chop down a huge patch of invasive phragmites at Pine Tree Brook in Milton. Phragmites (a type of common reed) aren’t just an issue in the Neponset, they invade many salt marshes and more inland wetlands all across Massachusetts and New England. They are so prolific that they often become the dominant plant in many of these wetlands, squeezing out other native plants that once were able to thrive in the wetland habitat. This is an ecological concern because the reduction of plant biodiversity chips away at habitats that many native fish and wildlife species rely on. 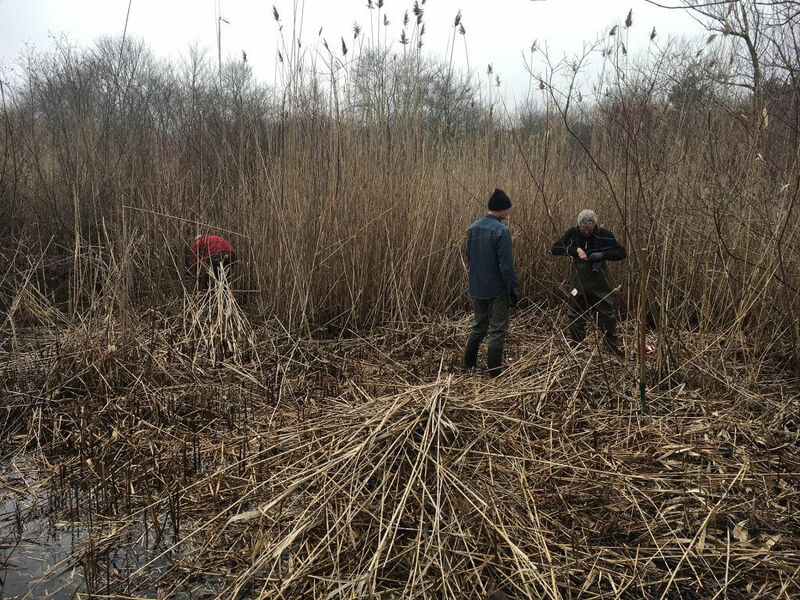 Volunteers helping NepRWA staff cut down Phragmites in February. 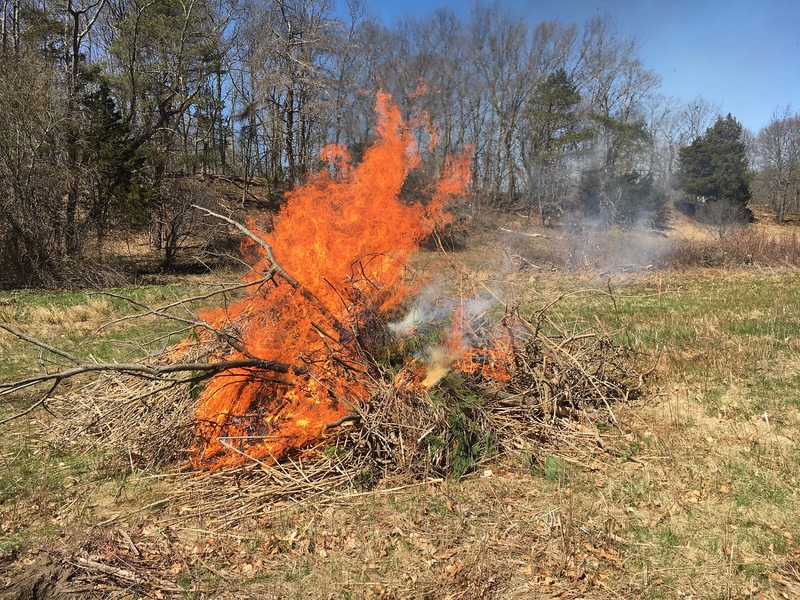 Our plan was to cut back the dead phragmites left over from last year’s growth, haul it out of the stream, and bring it to a clearing at a farm in Milton to burn. 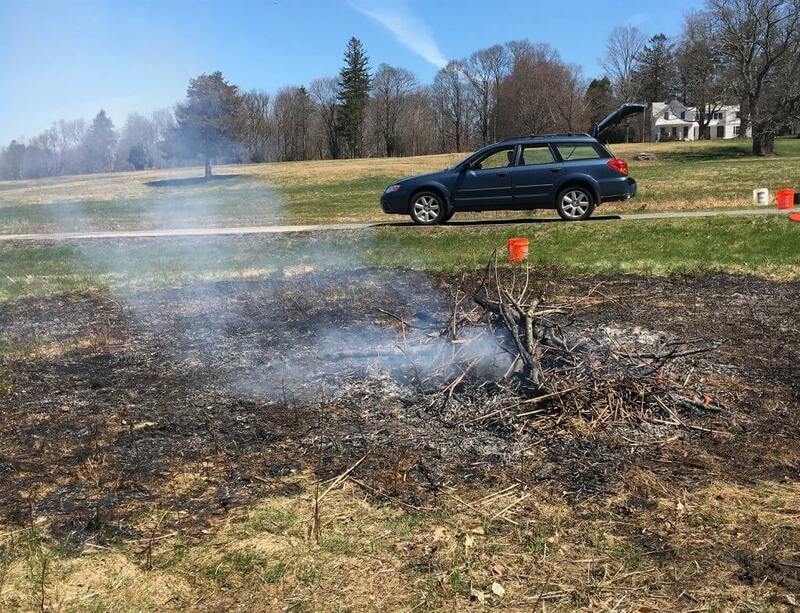 With the help of the Milton DPW, we filled up a truck with what we could and brought it to dry out where it would eventually be burned. Before – the pile of Phragmites to be burned. Chris, our Environmental Scientist, stands nearby for scale. During – the Phragmites lit up in mere mintues. After – all that was left after about 40 minutes of burning! Why burn the phragmites? It has to do with how they grow. Cutting them down does very little to dissuade regrowth, because one of the ways they spread is through rhizomes – underground stems that are connected to a parent plant and capable of growing shoots. Even if you chop down phragmites, they can still expand their area of growth this way. Burning the cut material lessens this risk. However, the base shoots are still present in Pine Tree Brook, so we’ll need some extra help from herbicide. While using herbicide is never our first choice, the aggressive nature of Phragmites leaves us with little alternative. This coming fall, NepRWA will have a licensed applicator treat the new sprouts that will inevitably grow from the cut stems with a wetland-safe herbicide. Fall is the best time to apply herbicide because that’s when you have the best chance of killing the rhizomes once and for all. Also, the new shoots should be easily visible to the applicator so they will not need to use so much herbicide. It is our hope that since the tall, sun-blocking, phragmites will be absent at the start of this years’ growing season, other native plants like Cattails can start to make a comeback in the area. Increased plant diversity can only improve the overall health of the wetland. We will continue to monitor the site each year until there seems to be a stable, healthy, habitat with native plants.